Is Terry Collins Detached from Reality, or Playing Head Games? I realize that Terry Collins hasn’t been in a big-league dugout as an MLB skipper in over a decade, and many things have changed in the game over that time. For example, the scorecards look different now, and people track a few more statistics since the 20th century. The players don’t wear stirrups anymore, and they’re not allowed to drink “special coffee” before the games. However, even in the old days, I don’t ever remember a dropped ball causing a player’s skills to erode, or to cause injuries. What If Luis Castillo Wins 2B Job? After a long delay, Luis Castillo finally arrived on time in Port St. Lucie. I know many people are miffed that Castillo didn’t get to camp a week ago, but he had a legitimate reason — his brother is going in for serious surgery next week. Even if he didn’t have a personal matter to tend to, I’m not sure that an early arrival would have made a difference one way or the other in regard to his chances of making the team nor in the way he is viewed by the new Mets management (the on-field and front office staffs included). Yes, it would have been nice if Castillo showed up around the same time as the pitchers and catchers. But really, at this point, how would it have mattered? He’s been in pro ball for 15 years, and by now should have a good idea of what he needs to do to get ready for a 162-game season. You could say that by arriving early, Castillo would have “sent a message” that he’s “serious” about having a comeback season. But in all honesty, is that really what you want? Be careful what you wish for, the saying goes. 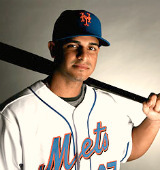 Is there a Mets fan alive who wants to see Luis Castillo at second base on Opening Day 2011? Unfortunately, it will take a minor miracle by Sandy Alderson to move him this winter — without swallowing some or all of the $6M left on his contract. 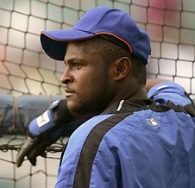 But let’s pretend Castillo is out of the picture, and the Mets are looking at the free-agent market to take his place. In such a case what are the Mets’ options? Through 13 minor league seasons, all Jesus Feliciano did was hit, hit, and hit some more, posting a career .285 batting average while playing solid outfield defense. However, he didn’t do much else. For example, he didn’t get on base very often until fairly recently, he didn’t do anything extraordinary on the bases, and he didn’t hit for much power. In many ways, he was the minor league, outfield version of Luis Castillo: a singles hitter with above-average speed and solid defensive skills. Unfortunately for Feliciano, there isn’t much demand for an outfielder with Luis Castillo‘s offensive skill set. Thanks to a rash of injuries, Feliciano finally made it to the bigs in 2010, and showed a ton of hustle, strong fundamentals, and the ability to put the bat on the ball. He didn’t get the ball to fall safely often enough to turn heads (.231 AVG / .276 OBP / .563 OPS in 119 plate appearances), but he did provide entertainment with his occasional RBI singles, strong defense, and passion for the game. His MLB debut at age 31 was an inspiration and one of the feel-good stories of 2010. 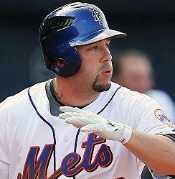 Unless something awful happens in 2011, there likely isn’t room in the Mets outfield for Jesus Feliciano. I imagine he’ll either move on to another organization or return to Buffalo next season, and keep grinding it out. He knows how to play the game, respects it, and should have a career as a coach or manager some day if he chooses to go that route. 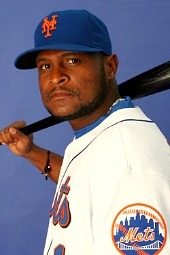 You hate Luis Castillo – I get it. We all thought that Omar Minaya was out of his mind for bidding against himself and giving Castillo a 4-year, $25M contract. We all knew it was a bad decision before the 2008 season even started, and we continue to suffer through the frustration that Castillo will be paid by the Mets through the end of 2011 – assuming Sandy Alderson can’t find a similarly bad contract to swap with this winter. Although Castillo had a pretty decent year in 2009 (.302 AVG, .387 OBP, 20 SB), he was nowhere near the level of “acceptable” in 2010. Dogged by injuries from the outset, Castillo finished with a career-low .235 batting average and .337 OBP. Further, his defense took another step backward. A completely healthy Castillo – meaning, his legs are 100% — is not a terrible solution at second base. However, if Castillo doesn’t have his legs, he doesn’t have anything, and IS a terrible solution at second base. Castillo’s game is to slap or walk his way on base, then run around them toward home plate. Similarly, his legs are key to his defensive prowess, in regard to both his range and his ability to turn a double play. Without healthy legs, Castillo has nothing else to offer a Major League Baseball team. Which is a shame, because as much as you may hate him, he’s really not a bad guy, is a team player, a smart ballplayer, and a hustler. But at this point in his career, it’s hard to justify his having a job – much less paying him $6M. Despite the fact that Moneyball glorifies OBP, and that is Castillo’s traditional strength, there is no doubt that Sandy Alderson will try to either swap Castillo for another bad contract or release him outright. Either way, it probably doesn’t make a difference since the Mets are going nowhere in 2011. If by chance he can get his legs back, and the Mets manager can play him sporadically enough to stay fresh, he could play well enough in the first three months of the season to delude a playoff-contending team into giving away a prospect for his services come July. It’s not much of a risk from the Mets’ perspective, considering that 2011 is a rebuilding year and neither Ruben Tejada nor Reese Havens belong in MLB yet. Would You Trade for Chone Figgins? Quick question: if you were the Mets GM, and the Mariners offered you Chone Figgins for Luis Castillo, would you pull the trigger? Better yet, if the Mariners agreed to also take on some or most of the contract of Oliver Perez, would you do it? This is EXACTLY the reason the 2010 Mets are so endearing: when they are backed up against a wall, they come back fighting! Shame on all the impatient, critical naysayers who hit the panic button after the Mets dropped the opener in Atlanta — this team is for real and is poised to go on a rampage! In this dramatic come-from-behind win, the Mets proved they have guts, grit, and a tenacious will to win. My guess is that the locals will recall memories of General Sherman by the time the Mets leave Atlanta. And who would be the one to carry the Mets to a ninth inning victory? None other than the team’s #1 clubhouse personality and all-around great guy Jeff Francoeur, who silenced the critics with an opposite-field solo homer off of former Met Billy Wagner to put New York ahead for good. Prior to the game, many wondered why in the world Jerry Manuel wrote Francoeur’s name into the lineup against Derek Lowe. After Francoeur’s game-winning blast, is there any question? It amazes me that amateurs are always second-guessing Manuel, thinking they know better. It’s nights like these that make it obvious why we are all doing what we’re doing for a living, while Manuel makes three-quarters of a million dollars to do what he does. The man knows how to play the matchups, and has a knack for making great hunches — no amount of experience, intelligence, or calculator-punching can re-create that skill; it’s innate. R.A. Dickey impressed with yet another strong outing, this time plowing through 6 innings and allowing 2 runs on 5 hits and 4 walks. He ran into a few jams but worked out of them with a dancing knuckler and uflappable demeanor. I think his performance was something of an inspiration for Francoeur. Speaking of, Francoeur scored two of the Mets runs — and his doghouse roommate Luis Castillo scored the third. So there, all you judgemental critics! As great as Francoeur and Castillo were in this game, one cannot overlook the spectacular performances of Manny Acosta and Francisco Rodriguez. Acosta was throwing BBs through an inning and two-thirds, earning the victory while bridging the gap to K-Rod. Francisco was fabulous, expending a baker’s dozen worth of pitches in a perfect ninth to seal the victory and earn his 23rd save of the season. Bobby Cox made some very strange moves in this game, and his players made some very un-Coxlike non-executions. In particular, I’m not sure why Cox had Rick Ankiel bunting at the first pitch with none out and a Alex Gonzalez on first after a leadoff walk in the 7th, especially when Acosta appeared to be struggling to throw strikes. Cox took the bunt off after one strike, but why give Acosta a strike there and why take a strike away from Ankiel? Maybe Cox thought Ankiel was still a pitcher. Later that inning, Gonzalez took off for second and was thrown out by ten feet in what must’ve been a missed hit-and-run. Since Gonzalez just joined the team recently, maybe he misunderstood a sign? Or maybe Melky Cabrera missed the sign. In any case, the caught stealing was huge, as it was the second out of the inning and Cabrera walked on the very next pitch. Acosta would have been in a very sticky situation had it been one out and men on first and second rather than two out and a man on first — who knows how things might’ve turned out? The rubber match begins at 7:10 PM on Wednesday night in Atlanta. Mike Pelfrey goes to the hill against Chris Medlen.